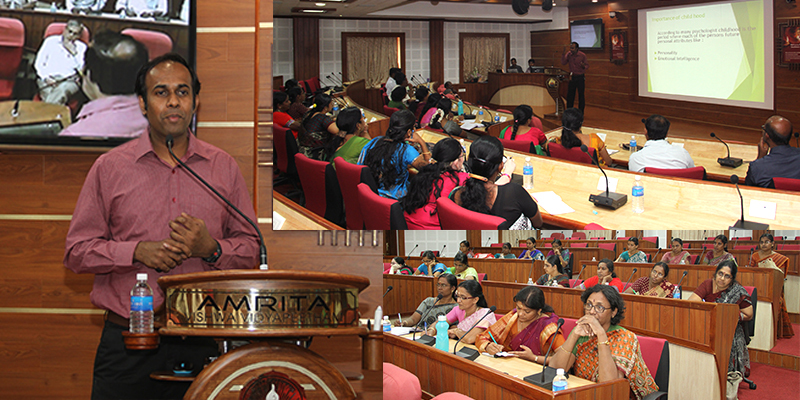 The Corporate Training wing of CIR conducted a one day workshop for Teachers of Amrita Vidyalayam, Nallampalayam on 25th January 2014. The main theme of the workshop was empowering the teacher. The topics covered in the workshop were, (i) Know the Child, which dealt with the different developmental stages of the child and the strengths and weaknesses the child will develop at these developmental stages (ii) Uniqueness of the child; which dealt with the uniqueness of the children in terms of their abilities and learning styles and (iii) Effective communication styles for teachers; which assessed the communication styles and provided ways to make it more effective. The workshop was delivered by Dr. Madhu Menon; Prof. C. Parameswaran inaugurated the workshop and Wg Cdr. (Retd) A. Balachandran gave the vote of thanks.